Dancer Asimina Chremos during a rehearsal at Crane Arts’ Icebox Project Space. When she was a child, dancer Asimina Chremos was fascinated by a book of Hans Christian Andersen fairy tales illustrated by the storyteller’s own paper-cut artwork. 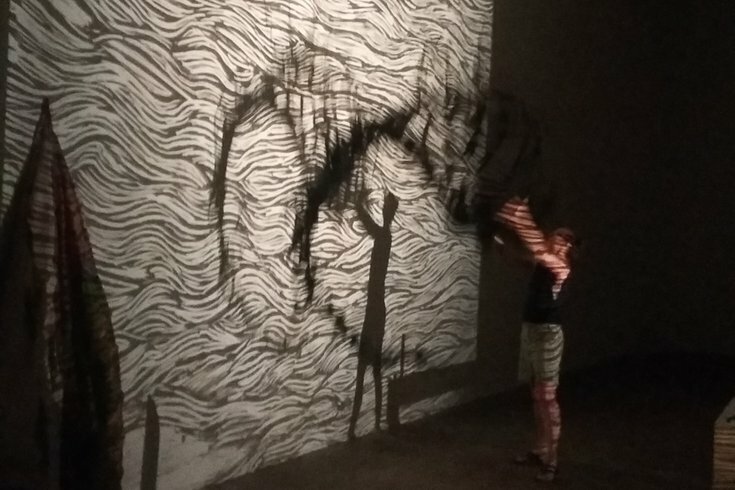 When she first saw the work of Erik Ruin, whose performances employ intricate paper-cut images and overhead projectors, she was immediately drawn back to those haunting pictures from her past. When the two began working together earlier this year, it gave Chremos the opportunity to enter and explore the fairy tale landscapes that had been such a vivid early influence. Ruin and Chremos will continue their partnership on Saturday at Crane Arts’ Icebox Project Space, as Chremos will perform with Ruin’s ever-shifting group of musical collaborators, the Ominous Cloud Ensemble. In its latest incarnation, the ensemble will include trombonist Dan Blacksberg and guitarist Nick Millevoi of experimental music duo Archer Spade; percussionists Julius Masri and Scott Verrastro; DM Hotep, guitarist of the Sun Ra Arkestra; punk-oriented prepared guitarist Reid Books; and violinist Lindsay Baukert. This weekend’s performance marks the Ominous Cloud Ensemble’s most ambitious project to date, an hour-long piece called “Play Death More Sweetly” which Ruin says “aims for the sweet spot between a performance and an installation.” Taking full advantage of the spaciousness and echo-drenched resonance of the Icebox, the piece is inspired by the work of Romanian-born poet and Holocaust survivor Paul Celan, in particular, his “ Todesfuge,” or “Death Fugue,” a response to the horrors of the concentration camps. While Ruin, Chremos and the musicians have been discussing the ideas in Celan’s poem and possible ways in which to respond to it, the actual performance will be largely improvised. Preparation, Chremos says, has largely involved “planting seeds in my imagination form the imagery of the poem.” Ruin is taking a similar approach, creating paper-cuts sparked by pictures painted by Celan’s words, from mentions of almond-shaped eyes to evolving landscape and a home that gradually fills with fire, water and earth. One recurring theme that both artists responded to is the description of two women, the golden-haired Margarete and the ashen-haired Shulamit. In the more literal sense, Chremos has been experimenting with a spiral-cut piece of black fabric that evokes the idea of hair while also mirroring Ruin’s paper cuts. But the comparison of the two women, with its poignant use of “ash” to tinge the description with the grim remains of the Holocaust, also felt powerfully relevant to horrors in today’s headlines. “We’re in a place where a lot of really terrible things are being uncovered, unearthed and seen in a way that they maybe haven’t been for a really long time, especially for white people,” says Erik Ruin. While it would be easy to get weighed down by such heavy themes, Ruin and Chremos seem buoyed by the thrill of a new collaboration, one which has so far yielded thrilling discoveries. The interplay of improvised music, projected images, and Chremos moving through the vast Icebox space in the throw of light from Ruin’s projectors offers ample space to explore.